Our goal is to produce the very best Pudelpointers that can be offered in North America, for only the most serious hunters, without getting into the "puppy factory" business. We are serious about preserving and improving on the qualities and attributes that made the Pudelpointer the great versatile dog they are today. Receive at least 105 points in a NAVHDA Natural Ability Test. Earned a Utility Prize in a NAVHDA Utility Test (optional for females, but prefferred). Be certified to be free of hip dysplasia by Penn Hip or OFA (Penn Hip preferred). Have a sound temperament; good coat and confirmation. Demonstrate exceptional hunting performances on wild birds and waterfowl. Since all dogs at Cedarwood Kennels are NAVHDA tested and qualify in a NAVHDA Utility Test, we obviously believe in the NAVHDA breeding approach. The NAVHDA system is based on a testing system under which many versatile breeds were developed; one which is rooted in the science of animal breeding and selection. Under this evaluation system. Our observations in the field on wild birds are a very important part of our evaluation process when selection breeding stock. Pen raised birds can't in any way duplicate the necessary inner focus required from a dog to successfully produce birds both before and after the shot for today's serious sportsman. While spending >100 days annually in the fall hunting only wild birds, our dogs are under constant evaluation of the intelligent purpose required to handle; the five species of grouse found in the Northwest; pheasants from Idaho to the Dakota's; chukar in Idaho, Oregon and Nevada; and foremost, the December/January waterfowl of the Snake River Valley. We strongly urge interested sportsman to research the background of any sporting dog they may be considering. Remember, the genes are passed on from generation to generation and a strong pedigree should look strong throughout. NAVHDA testing information and the Penn Hip or OFA results should be available on every dog on a 3 generation pedigree. Don't ever just look at the pups parents, more genes are passed on from the grandparents and great grandparents than from just the 2 parents. If you're thinking about a new hunting companion, the NAVHDA Natural Ability scores of the parents, grandparents, and great grandparents is by far the most important part of the breeding equation for obtaining a top performing dog. Make sure you study the pedigrees of all three generations before acquiring a dog expected to meet your expectations. It is for this reason that we post the pedigrees of the dogs that we breed on our "Breeding Stock" page of our web site; complete with all NAVHDA testing accomplishments. You can now compare the quality of our breeding dogs to other kennels or breeds to get a feel for the quality of versatile dogs that can be produced. If you are looking for a hunting dog, make sure your breeder hunts and his expectations are as high or higher than your own. If you are also looking for a family companion inquire as to the calm personality of the parents (especially their sire) and if they reside inside the home or if they are merely kennel dogs. This expectation should be a simple request that a breeder should have available for examination by future clients. By posting our pedigrees on the "Breeding Stock" page, one can view the parents, grandparents and great grandparents, individually, and see their NAVHDA testing accomplishments. You can merely "click" on a dog's parent or grandparent and are taken directly to that dog's pedigree. When serious sportsmen begin researching for a new hunting companion, often times, the Pudelpointer surfaces as a sound possibility for a versatile dog that will also serve as an excellent family member. Falling in love with this breed is only the beginning if you are seeking to obtain a dog possessing the characteristics that bring the pudelpointer to the front of all the versatile breeds. There are breeders, unfortunately, merely breeding Pudelpointers for profit making no attempt to maintain the wonderful personality or hunting qualities that the breed should offer. If you dont have the right dogs to begin with and are limited to merely one stud dog, it's hard to be recognized as a breeder; you're merely a "backyard breeder". Discovering this breed is only the beginning for someone interested in obtaining the best possible hunting companion available. Afterall, this is going to be a 12 to 14 year committment. Our breeding stock must have that "clownish/affectionate" personality that separates our dogs from all other sporting breeds. 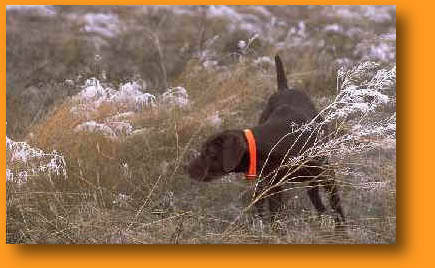 Our breeding dogs are also our personal gun dogs living as house companions and as a family member. We house 4 of our dogs here at Cedarwood Kennel and they live in the house with us. The other forty some dogs are house dogs living with our children or hunting friends here in Boise. With this arrangement we can boast that every dog on our websites Breeding Stock page is a house dog; just not all at our house. We don't leave our gun dogs in a kennel merely waiting for the next breeding season as is seen in so many different kennels of other more popular breeds. We breed hunting companions for families, not hunting dogs just for hunters. Having >40 dogs in our breeding program allows us the breeding diversity required to make the best decisions possible when selecting various dogs for mating. Kennels owning merely several dogs can only breed to their own limited selection making it very difficult to produce the quality of pups that we expect from each of our litters and have been discussing on this site. When we are selecting a stud dog for a mating, we have 15 males to select from; not merely one. Bob Wehle of the famous Elhew kennels asked me 25 years ago "how many male pudelpointers do you have to select from for each breeding". When I told him one, he abruptly let me know that I was just a backyard breeder and until I had 6-8 stud dogs I needed to quite referring to myself as a kennel owner. I owe alot to Bob Wehle, as his frankness helped me understand the genetic diversity required to create a program such as Cedarwood Kennels has now. Presently, 25 years later, and I can honestly say Cedarwood Kennels is producing the best pudelpointers this breed has ever witnessed. Cedarwood Kennel has had >300 pudelpointers tested across North America in NAVHDA Tests and has maintained an average Natural Ability score of 108 points and a Utility average of 190 points for those tested dogs during the past 10 years. Our kennel has personally tested 49 dogs in NAVHDA Utility Tests, and it is for this reason that we find it so offensive when another breeder merely breeds for profit without proper qualifications prior to a mating. Fortunately these kennels are easily recognized, as they have a very limited selection of dogs with very limited testing accomplishments to their credit, while trying to ride on the coat-tails of this breed and the breed's successful breeders. We have also earned 20 NAVHDA Breeders Awards and have sired 5 Versatile Champions for the breed. In Addition, Cedarwood Kennels has produced the only 4 National Shoot to Retrieve (NSTRA) "First Place" winners this breed has experienced, along with the only NSTRA Champion. These are all the rewards from a breeding program that breeds only superior performers; never average. Always, staying with our proven breeding program and not introducing inferior/lesser genes to our Cedarwood gene pool.